Here's my another variation of Eggplant & Okra "Age-bitashi" (i.e. deep friend, then marinated in a broth or sauce). The style is completely different from the last version...this version doesn't require simmering nor addition of dashi stock. The flavor is more bold and eclectic Asian-style. 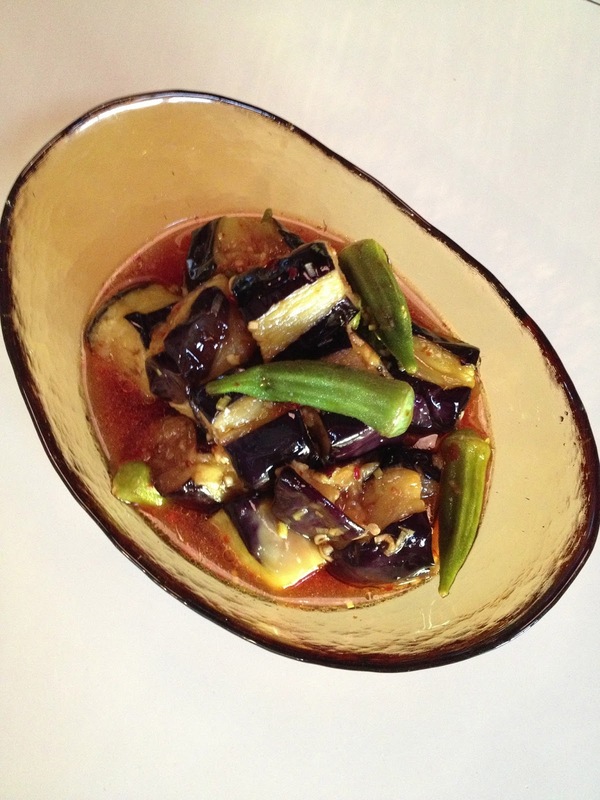 Eggplants are deep-fried and drained of excess grease, then added to the sauce. The sauce is the mixture of doubanjiang (Chinese hot bean paste), soy sauce, fish sauce, mirin, honey, and black vinegar, with minced ginger, garlic, and scallion. 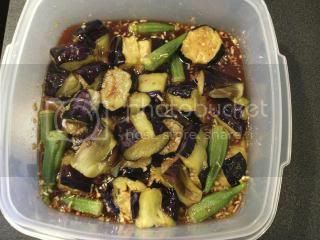 By marinating for 1-2 hours, the fried vegetables have really nice rich flavor with a spicy kick. The Japanese black vinegar ("kurozu") adds the extra umami flavor and so nice. I like it at a room temperature. Wonderful! In a large bowl, whisk together the ingredients for the marinade sauce. Set aside. 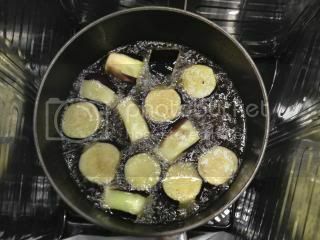 Deep-fry the eggplants in the 350F (170C) degrees oil until just tender (2-3 minutes). Let them drain excess grease by using paper towel. Deep-fry the okra until just tender (about 1 minute), and pat dry. Add the vegetables to the marinade sauce. Cover tightly. Let it rest for at least 30 minutes and enjoy warm or at a room temperature. Or, you can transfer the dish to a different container and refrigerate up to 1 day and enjoy chilled.